Many seniors’ lives are cut short because the quality of their life deteriorated due to social isolation. Available research shows that seniors who stay connected to their loved ones live longer than those who live their autumn years alone. While many would want to maintain close contact with their parents, it is not always possible or realistic to be there for them in person. Make sure your senior loved ones have a smartphone and know how to use it. If you need to, teach them how to use various functions like receiving calls, writing and reading text messages. Make sure they also know how to open their emails and download attachments. You might not realize it, but these simple technologies can play a big role in ensuring that your senior loved ones don’t live life in isolation. You can send photos of you and your family and they can also send you photos of them via email. You can also use email to talk to the rest of the family about caregiving for those aged loved ones. Now and then, make sure you call them to ask how they are doing. A simple phone call can boost their morale. These are better than text messages and emails because you get to see your seniors and they get to see you. Take time to teach them the necessary technologies to use video chats and webcams. 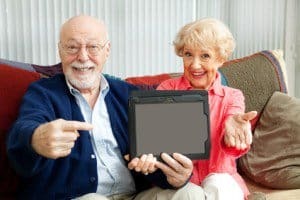 You are at an advantage if your senior loved ones are tech-savvy. Download for them FaceTime, Skype, or other such program and make sure it is working on their computer. You could also register them for Google Hangouts. With these technologies, you can even have family meetings where everyone can be seen and heard from wherever they are across the globe. You will all have the chance to see how your loved one is doing by analyzing how they look, and what they sound like. You could then talk to their caregivers about your concerns or plan a trip to see them in person. This one is especially helpful when your loved ones are under the care of a senior caregiver. The caregiver can send you word documents and spreadsheets outlining your loved one’s appointments, finances, and even medication. This way, you can keep track of most of what is going on in his or her life and make the necessary decisions to see them get better care and live a consistently quality life. You can also ask your senior loved ones to fill up the excel sheets on their finances, their medication, and even their appointments. They can then send you these documents via email.